The Hackers of the past are a dwindling group of people. The hackers of the future have a bright journey ahead of them. The whole culture behind a hacker has shifted and is evolving over time. The new culture is taking over a dwindling past time. Phrack and 2600 both talk about the hacking underground changing and morphing. They both don't see the light at the end of the tunnel, but I will to show them a new tunnel. The hacking underground is still alive and well, but in a different format. Hackers of the past were for freedom of information and to some, open source software stated by Richard Stallman. Both Phrack and 2600 are looking for new outs and ins. They both talk about how hackers have left the underground and joined the computer security job. While security is important, it has basically ripped through the underground and taken a big chomp out of its culture. No one knows how long the underground will stay active and they are of course looking for another course of action, but who will provide? At this moment, there could be three type of hackers in the world. The first type of hacker is your old school underground hacker. It isn't your script kiddies, but the ones of the past. The kind of hackers that ethically or unethically broke into computer systems for the freedom of information. To open the world to more information. This is the hacker of the past. The underground hackers still exist today, but their culture is falling to the floor with its last foot on the step. I hope to revive the culture in the coming years. 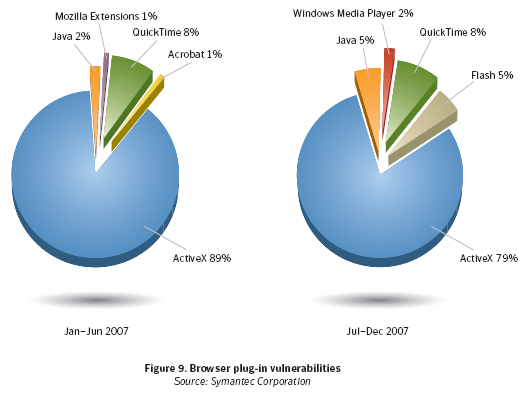 The second type of hackers are the ever failing computer security hackers. This type of guy left the underground years ago to earn some money for doing what they love. These hackers, left a large gaping void in the underground culture and have stopped the true ideal of a hacker. They no longer hack. They now prey on the underground for security secrets to divulge to the world. About 6 months ago, a huge flaw was found in the basic dns of computers. It was the security hacker who released the flaw before it was patched. It was the security hacker who put the entire world at risk just for a little more publicity. Why does this type of hacker need the publicity? Because their jobs are turning into nothing. They are losing work, though staying very busy, they are no longer having as much fun as they were sitting in front of a computer at 3am in the morning working on the next system and show them it has a flaw to the world. The third type of hacker has been around for years and years. It was supposedly started back in the 1950's with amateur radio enthusiasts. Looking for a new way to improve performance, which they coined the term hacking. They have come from MIT in 1959, Stewart Brand in 1972 when he publishes SpaceWar. It was made popular around 1982 when Tron and WarGames came out. The third type of hacker is the hobbyst. The guy that goes home after working a 9-5 job and working on some piece of software or hardware. This is what hacking and the culture has turned into. The type of person that enjoys solving real world problems. The person that might choose to make a few bucks with their new gadget they just created or release it to the open source market which Richard Stallman and the creator of Linux Linus Torvalds strive for. The term hacking has even morphed and created user groups such as Ycombinator and Hacking News. The culture has changed a bit, but the underlying ethical ideals are still their. Open up to the world. The Homebrew Computer Club started it all, hackers of the underground kept it going and now hackers of the future will have continued the legacy. The security consultants though, will die off as the software of the future hackers get better. The computer and the idea of software engineering is still in its infancy. We have yet to see what new changes can be made, but I do know this. The culture changes, but the ethics remain the same. Which type of hacker were you? Do you feel upset by this culture change? Whenever I surf the web, I try to look for things to learn from. I try my best not to go to anything that can’t be learned from. I read news articles, I listen to audio books and some of my favorite movies are things that can be used in the real world. I specifically like the movie The Boondock Saints. But this blog isn’t about the Saints. Its about what I learn about the world and wish to share with others. Today I found a white paper published by Symantec, the virus ware company. 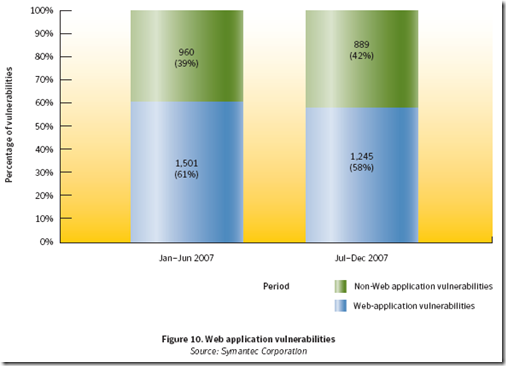 They listed off one of the most detailed papers about the overall Internet security threats that we were exposed to in 2007. I for one wasn’t going to read over the entire 105 page document. I just don’t have enough time in the day with all the other projects I am currently working on along with the countless hours of community service I try to do. I did skim over it and pulled out the graphs (I love Graphs, Visual representations are amazing) which are represented below. 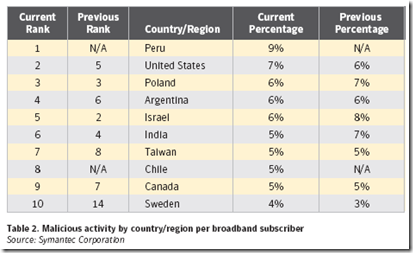 Below shows the malicious activity per subscriber to broadband. 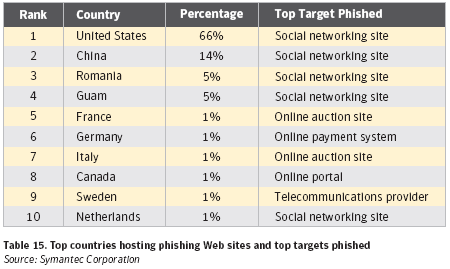 This shows that the countries shown above on the top echelon that are on the bottom echelon of the image below have allot of open connections and are privy to wireless attacks. 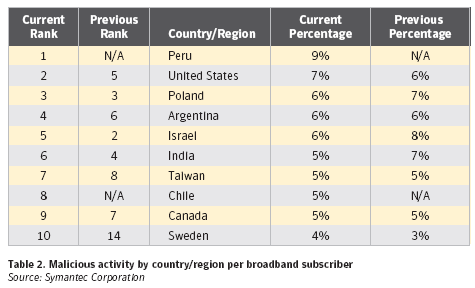 The countries above have a limited amount of Internet and the ones below have it spread throughout the country i.e. United States. Below shows how much each person is worth on the black market, which if you think about it, its not much money when someone sells an email list. It is almost disgustingly low. Am I only worth $15.00 to capture my social security number and other information (row three)? 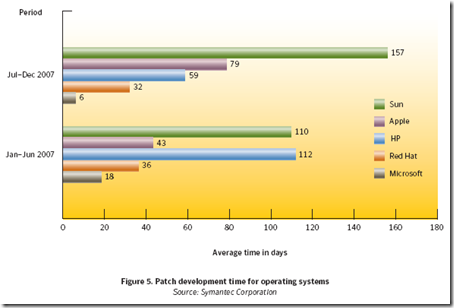 Below shows a breakdown of operating systems and how fast they can push a patch out. I am not going to argue for a particular operating system, but I am very happy to see with the amount of money Microsoft has, they do push out patches extremely fast compared to Apple, Red Hat and HP. 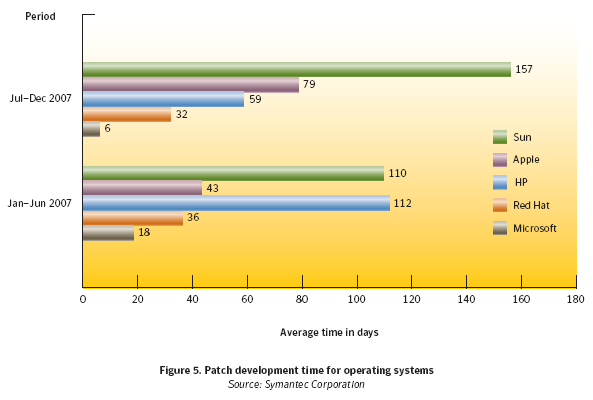 I always knew that Apple had a large amount of vulnerabilities, but this graph shows that Apple can be vulnerable for an average of 79 days, which gives hackers a huge window to develop farms or computers from a large amount of user base. If they get control of these computers, they can then distrbute on going updates to their code which would allow them never to be detected. 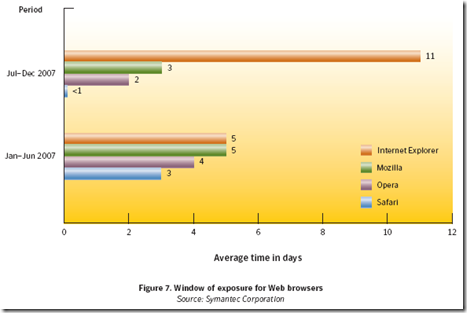 Below shows browser vulnerabilities which is an awesome display of how fast companies work. 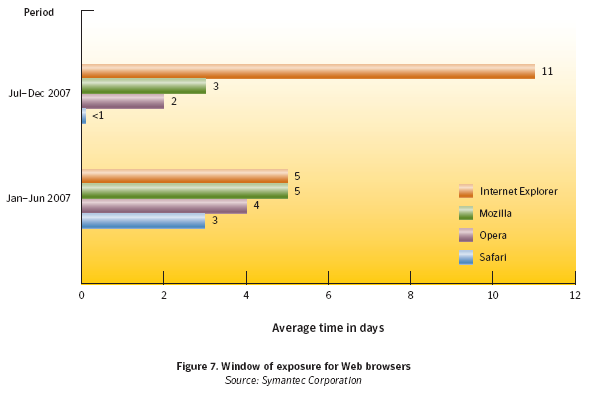 Even though Internet explorer is so high on the list of days, 11 days is still a pretty quick turn around. But of course I do surf with Mozilla Firefox, so I am better off than most. How many vulnerabilities were there in the past 6 months or a year? 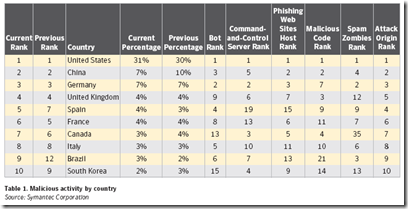 Looks like Firefox is high on the list, but I imagine they are getting a larger user base over the past 6 months and therefore are being exported allot more. Plugins are not the best thing to run on your site unless required by a customer who shows a specific user community. Active X is definitely the worst in this case and that is enough said. 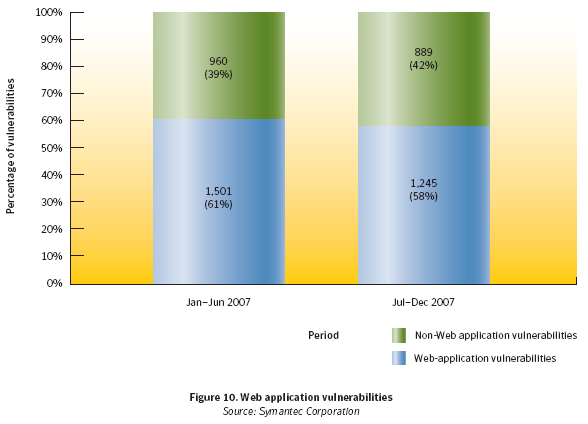 Below shows the amount of vulnerabilities in general for the passed year, which I am happy to say that they look like there overall decreasing. 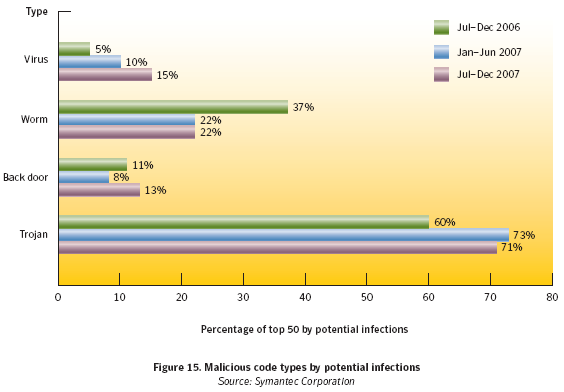 Below is the graph showing that the code being written for malicious purposes is growing and not on a small scale. It looks like it is growing by 100% every 6 months. That is huge, and it also shows that more and more countries are coming online and creating more user communities that destroy and manipulate. 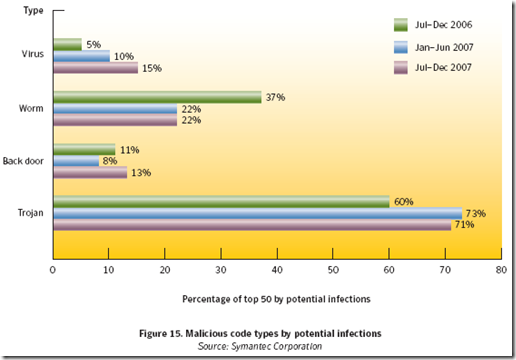 Below shows what kind of code is being written for malicious attacks. Trojan - is a piece of software which appears to perform a certain action but in fact performs another such as a Computer Virus. Wikipedia. Virus - is a computer program that can copy itself and infect a computer without permission or knowledge of the user. Wikipedia. How do things propagate and spread to other systems? Well the answer is file sharing with executables or .EXE files. Most likely done through P2P systems that download and upload software along with other highly wanted software. A user could accidentally open a piece of software and never know it was a virus until it was too late. For those P2P people out there who like sharing files, well I sure hope that you keep the directories closed and only share files through torrents. I know WinMX is still alive and kicking, but it has a hopefully robust detection system. Who deals with advertising on P2C systems like Google or Yahoo? I know I am a publisher as seen on the side of the page, but there are Trojans out there that automate it for people allowing them to rake in allot of money. I know I used to be a part of a group that practiced in this activity when I was around 14 or 15 years old. I surfed the net while having banners displayed on my desktop, but during that time I was able to get around it because of a group of Angels I was associated with. I have left all that behind now after taking in a large amount of money and putting those companies into bankruptcy. I look back on it now and wish that I hadn’t. 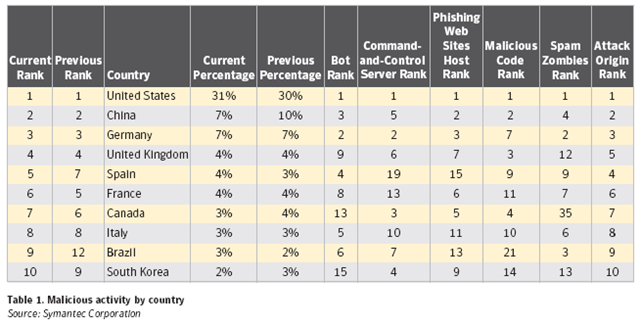 On the last graph, I am also curious to see that China is one of the highest Phishing domains out there, but how is this possible with the Great Firewall? 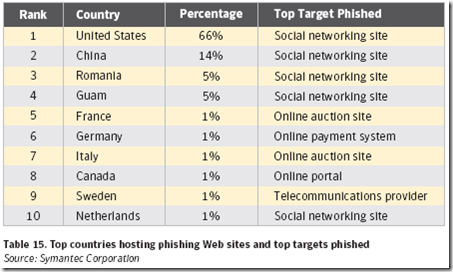 I hope you now have a better understanding as I do of the problems with the net these days and the top contributors to malicious technology.